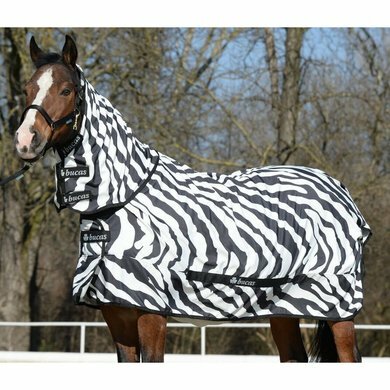 Derived from the very successful Buzz-Off Zebra fly rug, Bucas has developed a new fabric with the same zebra stripes that provides protection against the Culicoides mosquito (midges). In horses with summer eczema, prevention is the key to success: make sure you are preoccupied with the problem, by getting your horse to blanket before the mosquito season begins. 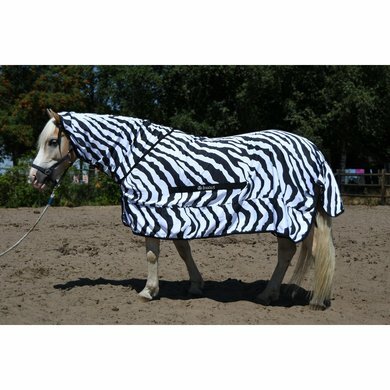 The first of its kind, the Sweet Itch fly eczema blanket with zebra stripes prevents the horse from being stung by the small mosquitoes and repels the large, aggressive flies. 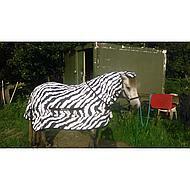 It has been scientifically proven that the flies get confused by the zebra stripes and thus stay away from the horse. 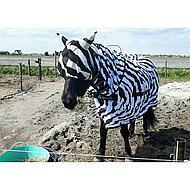 The unique Sweet-Itch Zebra blanket is made from a specially developed fabric that stops even the smallest insects. 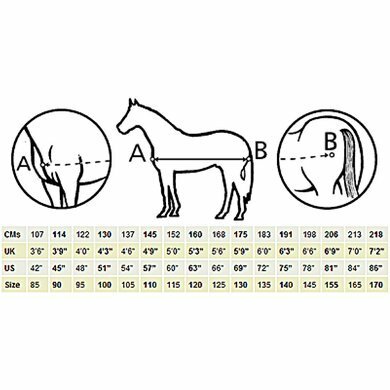 Extra attention has been paid to the mane and tail sections to protect them well and to prevent itching. 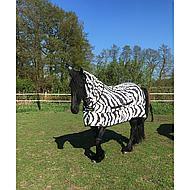 Bucas Sweet-Itch Zebra also offers UV protection and thus prevents sunburn and discolouration of the coat. 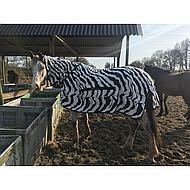 The design is a full 'body cover', with a neck piece up to the ears to fully protect the manes. 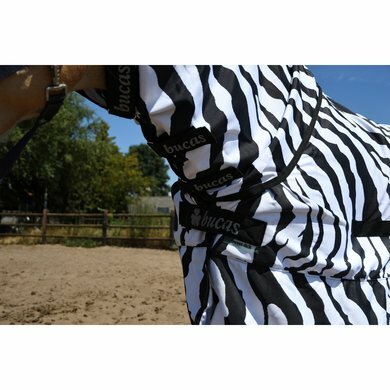 An elastic, detachable belly flap protects the entire lower abdomen of the horse, from elbow to crotch. Shoulder pleats provide extra freedom of movement. A large tail flap covers this problematic area and prevents the small biting flies from reaching the tail. 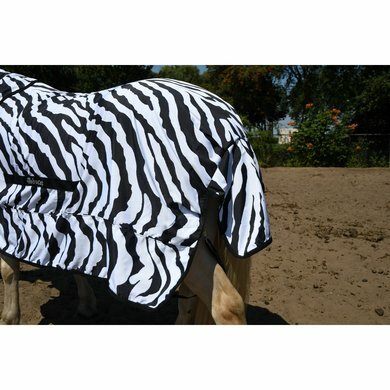 Bilcords keep the blanket in place and an overlapping, padded breast flap ensures that the blanket remains comfortable, no matter how long your horse wears the blanket. Blanket fits well, although the removable belly flap should have more room. I have now had to put an extra musceton on, but that works fine. 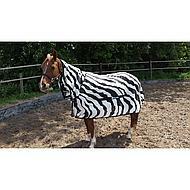 The blanket does not shift and is easy to wash in the washing machine. It has a nice closure and the neck has a good length and stays in place. The fabric is sturdy. As expected from Bucas, quality blanket, good fit. The blanket fits super well on my arab. has narrower shoulders and is well not sagging down. Abdominal flap fits well and closes well from front to back. neck stays well seated does not drop down even without halter is good. closures are good. 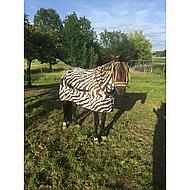 I am satisfied with the blanket, Super! Question: Is there a mask with this blanket? Question: I always have the Bucas buzz off full neck for my horses. This is not very strong and gets bad badly with the sanding. I hardly do 1 year. Now this sweet itch seems to be of stronger material. Is this true? Is this blanket not too warm? Answer: The eczema blanket is denser woven from fabric than the fly blanket and therefore somewhat stronger but also somewhat warmer. However, the blanket is not warmer than eczema covers from other brands.